Our first Amherst Athletes Hall of Fame induction this year is in the form of a posthumous award. Angela Coniglio of the Class of 1984 passed away a little over a year ago. Angela was a great all-around athlete in high school sports, as well as in community programs. She continued her active involvement, in college and in the years beyond. Angela Coniglio was one of the first female athletes to have the opportunity to participate in a full-fledged girls' program - and she really took advantage of it. When I looked through the yearbook to research this presentation, it seemed as if Angela's smiling face was on every other page. She earned a record number of athletic letters during her years at ACHS. Among the varsity sports she lettered in were softball, basketball, field hockey, and soccer. She was a captain of both the field hockey and basketball teams. In addition, she set a school record of 27 goals in soccer during her senior year, an was named to the ECIC Division II all-star team. She was also most valuable player on the league champion boys' hockey team. Outside of school, Angela played ice hockey as a goalkeeper on boys' teams - since there were no girls' teams at that time. Angela went on to Nazareth College, where she played four years of varsity soccer and set a school record for assists. 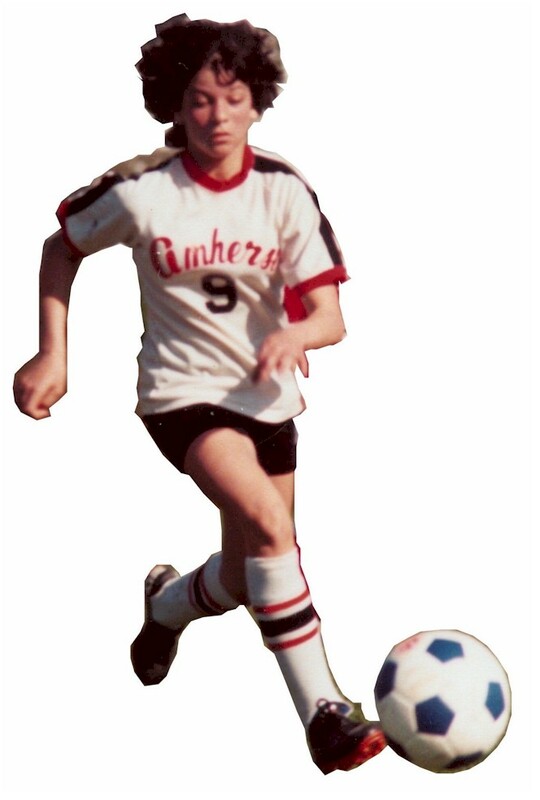 Angela also competed in the Empire State Games, and as late as 1995 was a medalist for the Central Region Open Womens' soccer team. Beyond athletics, Angela Coniglio went on to a very successful career in education. She taught science and biology, and coached girls' sports in the Auburn Schools, in Port Byron, at Notre Dame in Batavia, and then went on to a permanent position at the Clyde-Savannah Central School District. She was listed in "Who's Who Among American Teachers". The Amherst Schools are proud to include ANGELA Y. CONIGLIO in the Amherst Athletes Hall of Fame.